Edited by: Herrmann Jungraithmayr, Norbert Cyffer, Rainer Voßen. Series edited in collaboration with: Ulrike Zoch. West Africa is the most complex region of the African continent regarding linguistic and cultural variation. This might be due to the special geo-historical fate of the sub-Saharan continent in which about half of all the African linguistic and cultural communities can be found. The present series was originally founded as medium of publication and forum for the Collaborative Research Center 268 Kulturentwicklung und Sprachgeschichte im Naturraum Westafrikanische Savanne (1988–2002) of the Goethe University in Frankfurt/Main, Germany. Also after its end, the series concentrates on publishing works in Africa-related areas (African linguistics, ethnology, literary studies, musicology, cultural geography, etc.). In this context, manuscripts submitted by African colleagues working in West Africa are taken into consideration. Edited by: Dymitr Ibriszimow, Alhaji Maina Gimba. With contributions by: Alhaji Maina Gimba, Jürgen Heinrich, Rupert Kawka, Wilhelm Seidensticker †, Gisela Seidensticker-Brikay † [show more…], Musa Masaya Aliyu, Hauwa Maina Bukar, Dymitr Ibriszimow, Sabri Salama. Author: Hildegard Höftmann †. In collaboration with: Michel Ahohounkpanzon, Cécile Boko. Author: Ronald P. Schaefer, Francis O. Egbokhare. Author: Herrmann Jungraithmayr. In collaboration with: Njeno Andirya Galadima, Stephen Njeno Yoblis. Illustrated by: Ishaku H. Osman. Author: Hildegard Höftmann †. In collaboration with: Michel Ahohounkpanzon. Author: Umar Habila Dadem Danfulani. Edited by: Rupert Kawka. With contributions by: Michael Broß, Norbert Cyffer, Jürgen Heinrich, Joseph Ijere, Frauke Jäger [show more…], Rupert Kawka, Doris Löhr, Klaus-Martin Moldenhauer, Peter Odo, Bosoma Sheriff, Heinrich Thiemeyer, Ibrahim Walad. Compiled by: Njeno Andirya Galadima, Harald Vajkonny, Stephen Njeno Yoblis. Author: Herrmann Jungraithmayr. Translated by: Njeno Andirya Galadima, Stephen Njeno Pulkis, Harald Vajkonny. In collaboration with: Njeno Andirya Galadima, Stephen Njeno Pulkis, Harald Vajkonny. With an introduction by: Johannes Harnischfeger †. Author: Sabine Dinslage, Anne Storch. Edited by: Norbert Cyffer, Thomas Geider †. With contributions by: Shettima Umara Bulakarima, Norbert Cyffer, Tijani El-Miskin, Thomas Geider †, Yaganami Karta [show more…], Doris Löhr, Eldridge Mohammadou †, Editha Platte †, Wilhelm Seidensticker †, Bosoma Sheriff, Raimund Vogels, Wakil A. Wasaram. Edited by: Wilhelm Seidensticker †, Michael Broß, Ahmad Tela Baba. With a preface by: Norbert Cyffer. With an introduction by: Wilhelm Seidensticker †, Ahmad Tela Baba, Michael Bross. 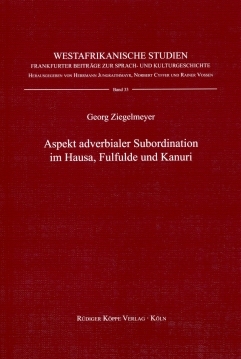 With contributions by: Michael Broß, Yusuf Mtaku, Hajara Njidda, Wilhelm Seidensticker †, Ahmad Tela Baba. Edited by: Dymitr Ibriszimow. With contributions by: Musa Masaya Aliyu, Hauwa Maina Bukar, Dymitr Ibriszimow, Sabri Salama. Author: James R. Bruce Lockhart. Author: Michael Broß, Ahmad Tela Baba. With drawings by: A.T. Sati. Edited by: Dymitr Ibriszimow, Alhaji Maina Gimba. With contributions by: Alhaji Maina Gimba, Jürgen Heinrich, Dymitr Ibriszimow, Rupert Kawka, Wilhelm Seidensticker † [show more…], Gisela Seidensticker-Brikay †. Author: John Stevenson Hall †. Edited by: Herrmann Jungraithmayr, Jörg Adelberger. Edited by: Herrmann Jungraithmayr, Gudrun Miehe. With contributions by: Jörg Adelberger, David D. Anderson, Michael Broß, Thomas Geider †, Herrmann Jungraithmayr [show more…], Ulrich Kleinewillinghöfer, Rudolf Leger, Gudrun Miehe, Uwe Seibert, Ahmad Tela Baba, Kerstin Winkelmann.